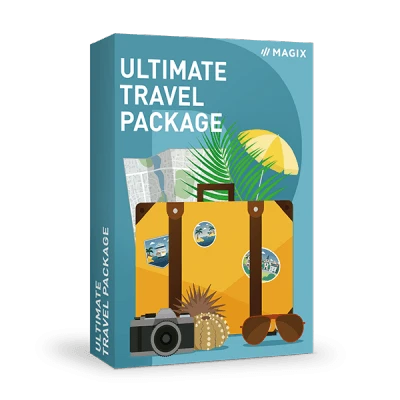 With brand-new travel route animation, MAGIX Travel Maps, with optimized maps for flights, cruises and hikes, you can show the course of your travels on a map and personalize the route with your stops and modes of transport. Would you like to remember the path of your hike forever? Then simply import your own routes using GPS information into your slideshow. Keep everything smooth! 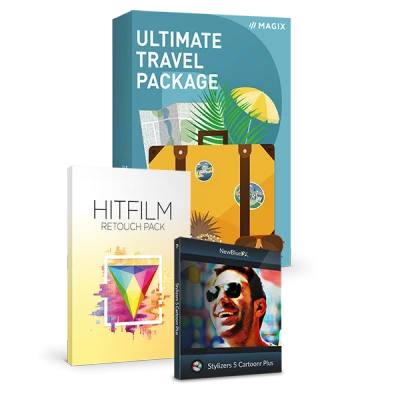 Benefit from a smooth animation of your itinerary by car, train or cruise ship. 100% developed from customer feedback: Fluid animations for your travel routes with smooth lines, pauses and animated waypoint symbols. 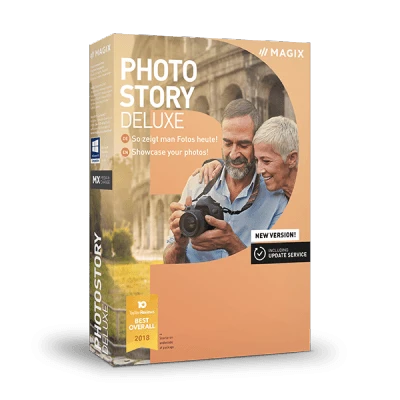 Photostory is now powered by the video engine from the market leader MAGIX Movie Edit Pro to guarantee best performance and quality. Create the perfect slideshow without external image editing: You'll now find image editing functions such as color temperature, black & white tonal values and curves directly within the program. A collection of high-quality 1-click photo effects enables you to find the perfect look for each and every photo in no time at all. Users now also have the option to import GIF animations. This way, existing cliparts can be used to create a slideshow. Slideshows can now be created and displayed in virtual reality. 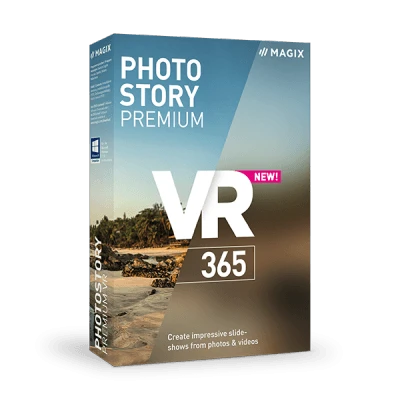 This new Photostory complete bundle fulfils the vision of virtual reality features that are so intuitive that anyone can use them. 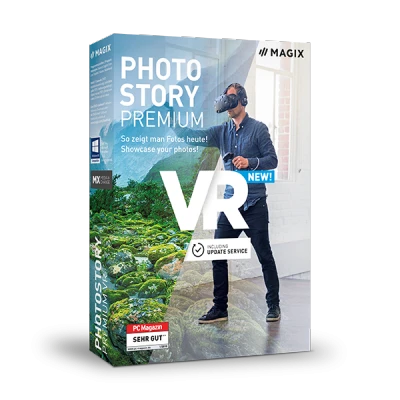 The complete bundle Photostory Premium VR Suite also includes the new MAGIX smartphone VR headset with an ergonomic design and adjustable headband to ensure total comfort. Effects can now be applied faster and more intuitively than ever before, and the rich, detailed results can be viewed in full screen mode. You can now set start and end points for camera pans or zooms directly within your images, simply by positioning the new control panel over the photo. All effects work on the same easy principle: Use the controller to find the perfect setting for brightness, color and picture sharpness and then apply with a single click. The Photostory Wizard can now import photos and automatically create breathtaking slideshows from scratch. In addition to faster navigation, the new effects area features improved orientation with its brand new color scheme. We've redesigned the import dialog to so that it's more clearly laid out and easier for accessing cloud services such as Google Drive. Direct photo import from Microsoft OneDrive is now also possible. Transitions are utterly smooth and vivid with color, thanks to 16.7 million times more color shades. You can now add more depth to light and shaded areas. Photostory includes the latest on-trend professional effects, from lens reflections for achieving a realistic look, to glow and color effects. Essential tools for photo editing are now also available in fullscreen mode. Creating a slideshow is now up to 5x faster and a seamless experience all thanks to new, dynamic resolution reduction. The selection of effects has been expanded with a huge number of new intros/outros, decorative elements and transitions and now also includes music too. Plus, a search function enables you to find the right effect in a few clicks. Users can now access the ever-growing selection of content in the Photostory Store from directly within the program. Media transfer with Camera MX is now more seamlessly integrated into the program interface. Use it to import your media directly to a project, the Wizard or the Media Pool. Make the most of a faster workflow for creating your own personal photo story. The media import window in the Photostory Wizard can now also be used for projects in the main program. Photos can now be edited and creatively modified in fullscreen mode in Photostory Deluxe. And the Photostory Wizard lets you modify yours the easy way - just drag & drop to change the order of photos. Also new: Text overlays in different styles. Photostory contains a huge range of songs in genres such as Chillout, Lounge music, Rock, Pop and House. The Photostory Wizard now offers significantly more features and improvements to workflow, such as the sorting page and advanced selection of effects and titles. With the Photostory Wizard, media import of your photos and videos is now even easier than before. The clear and intuitive screen with all key functions lets you automatically create slideshows to the beat of music you've chosen yourself. With just a few clicks you can finish a slideshow. If you like, you can then continue to edit your finished slideshow in the main program by adding creative design elements. You can apply the look of a video to other footage. The program automatically matches colors and tonal values of two separate videos to create a uniform look. The user interface has been revamped and now features a fresh, modern design and operation for the video monitor and storyboard. Edit black borders around your portrait photos using effects for seamless integration into your slideshows. Use Wi-Fi project transfer to transfer Camera MX photos and videos from your Android phone to Photostory Deluxe for editing. You can animate a travel route on a map, and even show places where you stopped off as well as choose a vehicle type for your illustration. While listening to the selected music, snap markers can be set to enable the images in the slideshow to change at specific intervals. Mercalli V2 by proDAD is fully integrated into the program and stabilizes shaky recordings. In addition, this tool can be used to smoothen out and correct unwanted effects such as rolling shutter and stuttering zooms. 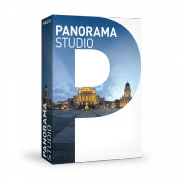 Select a section of a 360° photo in order to edit it and create a camera pan through the image. Thematic editing templates allow you to create photo stories for specific occasions (weddings, travel etc.). The latest title templates also provide contemporary, on-trend opening and closing credits, overlays etc. Photostory Deluxe is compatible with all current video formats, including RAW and HEVC (HEVC encoding requires fee-based activation). Photostory supports up to 4K, HD and 3D image resolution. Adjust brightness, contrast, saturation and color automatically or manually for enhanced image quality. The volume of a recording can also be automatically adjusted. 64-bit power enables a faster workflow and smooth playback. Slideshows can be burned to disc, presented on various platforms and websites, as well as transferred to smartphones, tablets and other mobile devices.